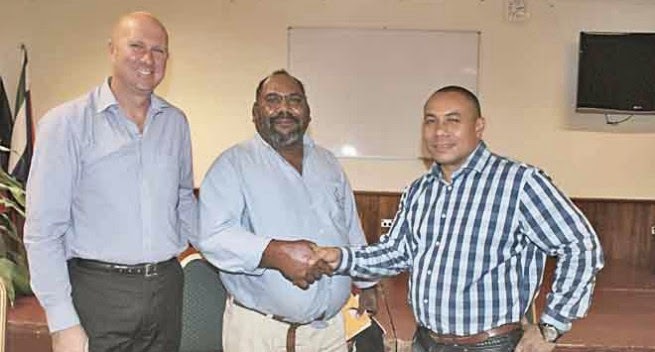 The National Government last Friday granted a Mining License- ML 508 - to Woodlark Mining (PNG) Limited (WML), operator of the Woodlark Gold Project and subsidiary of Kula Gold Limited which is an Australian company. The ML was granted by the Mining Minister Hon Byron Chan and witnessed by the governor of Milnebay Province Hon Titus Philemon, Managing Director of the Mineral Resources Authority (MRA) Philip Samar, DAL Wanuwan (woodlark landonwers association) and Milnebay provincial administration officials. The grant of the ML means that the company will begin work on mining the 2.1 million ounces of gold that has attracted PGK 600m worth of capital investment expenditure. The grant comes after 8 years of work by the company starting from exploration through to identifying the amount of resources, completing a bankable feasibility study and satisfying the government’s approval processes. Minister Chan said during the occasion in Alotau, that the granting of the ML demonstrated investor confidence in PNG’s mining industry. He said the government expected confidence levels to increase despite the current political climate, adding that this was because of a number of advancements being made by existing mining and exploration companies including Nautilus Minerals which is expected to begin mining in the next 18 months. Chief Executive Officer of Kula Gold Stuart Pether, said the grant of the ML marked a huge milestone for the company having spent 7- 8 years of exploration and related work on the project. He said the grant of the ML gave the company certainty over the title and hence confidence to the company’s investors, existing shareholders and their banks so that they could obtain funding to construct the project. He attributed the outcome to the cooperative efforts by all stakeholders which are the state, Milnebay Provincial Government, landowners and the company. Mr Pether said having acquired the ML, the company would soon re-engage with its financiers to discuss funding options that would allow the company to develop the project. DAL Wanuwan Association chairman Davidson Aisi said his people had been left in the dark for too long in terms of basic services delivery. He said the mining project is expected to bring development to his people as per ongoing Memorandum of Agreement (MoA) discussions.